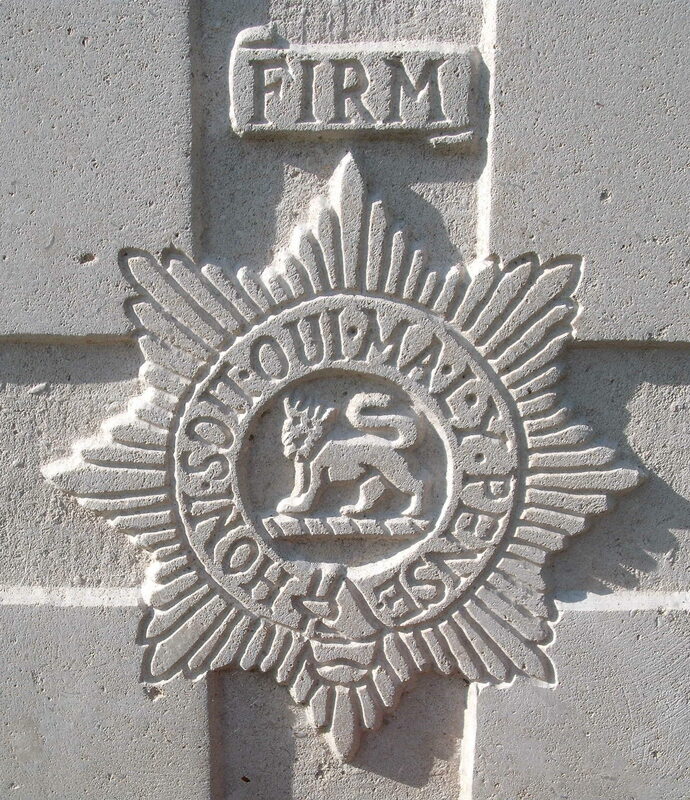 1/7th Bn, Worcestershire Regiment, 144th Brigade, 48th (South Midland) Division, B.E.F. Next of Kin: Husband of Emily Symmonds, of Pounds Bridge, Cradley, Malvern, Worcestershire. George Symmonds was born in 1880 at Cradley and married Emily Jordan in 1903. He joined the Worcestershire Regiment at Worcester and was posted to B Company 1/8th Worcestershire Regiment some time during the first half of 1916. Along with the majority of the unit, he was gassed on 19th July 1916 and was evacuated to a Convalescent Depot at Cayuex due to the ill effects of gas poisoning on 14th September 1916. He rejoined the unit on 5th December 1916, but was transferred to the 1/7th Battalion shortly after, on the 8th. It is likely that when a large number of men came back from the Convalescent Depot in December, the Battalion was over-subscribed, and men were moved to the sister battalion to make up battle casualties sustained during fighting on the Somme. The 1/7th Worcestershire took part in fighting at during the Advance to the Hindenburg Line in April 1917, when the Germans abandoned large areas of the Somme battlefield to take over strongly constructed and held positions further east. It is likley that Pte Symmonds was fatally wounded during this time and died in a Le Havre hospital some time after. It would appear that he had a brother, William, who joined the same unit (original regimental number 4061) and he also transferred to the 1/7th Battalion, although he appears to have survived the war.